Gossip: Dane crashed, Simon@Colony .. The release of the Same Thing Daily DVD is going to be delayed. Editor Dane Beardsley crashed jumping a handrail and broke his elbow. Get well soon Dane! Simon O´Brien joins the Australian Colony team: "I have recently made the decision to quit St. Martin as we both have different ideas on what direction flatland is heading. I am very pleased to announce that ´Colony´ bikes, an Australian company has hooked me up which im stoked to be a part of. 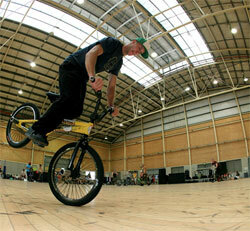 Along with Shane Badman we will be doing a wide variety of flatland products which we aim to be of awesome quality." Last but not least check out the probably longest hang-5 ever: longass hang-5.